Does the size of Aβ oligomers determine neurotoxicity? Since the reformulation of the amyloid cascade hypothesis to focus on oligomeric aggregates of amyloid beta as the prime toxic species causing Alzheimer's disease, many researchers refocused on detecting a specific molecular assembly of defined size thatis the main trigger of Alzheimer's disease. The result has been the identification of a host of molecular assemblies containing from two up to a hundred molecules of the amyloid beta peptide, which were all found to impair memory formation in mice. This clearly demonstrates that size is insufficient to define toxicity and peptide conformation has to be taken into account. In this review we discuss the interplay between oligomer size and peptide conformation as the key determinants of the neurotoxicity of the amyloid beta peptide. The original amyloid cascade hypothesis for Alzheimer's disease (AD)  has recently been reformulated to focus on soluble aggregates as the pathogenic molecular form of the amyloid beta peptide (Aβ)  (Figure 1). Aβ is naturally presentin the brain and cerebrospinal fluid of humans throughout life . Its role is currently unknown. The mere presence of Aβ in the brain is not sufficient to cause symptoms of neurodegeneration. It has been recognized previously that neuronal injury is rather the result of ordered Aβ self-association . The amyloid plaques found in AD patient brains, which serve as a hallmark for AD, have been found to contain vast amounts of Aβ organized into amyloid fibrils. There is no clear correlation, however, between the presence of the Aβ containing plaques in the brain and the severity of the neurodegenerative symptoms observed in AD patients . Therefore, the focus of research in this area has shifted from senile plaques toward soluble oligomeric conformations of Aβ as the toxic species as these strongly correlate with the severity of dementia [2, 6, 7]. This oligomeric form of Aβ is highly toxic to the brain and is the trigger for loss of synapses and neuronal damage [8, 9]. Because of this, many laboratories have been hunting for a specific molecular assembly of defined size that is the main trigger of AD. The result has been the identification of a host of molecular species of Aβ, ranging from dimers [10–12], trimers  and Aβ species with a molecular weight of 56 kDa  to Aβ-derived diffusible ligands (ADDLs) [15, 16] and protofibrils  in potent neurotoxic fractions. All are capable of impairing memory formation in mice and their formation and significant accumulation in the brain should thus be considered a potential cause of AD. The reformulated amyloid cascade hypothesis by Hardy and Selkoe  to include oligomeric species. This hypothesis suggests a sequence of pathological events leading to Alzheimer's disease. It further includes caspase 3 as a potential link between amyloid beta peptide (Aβ) and tau . Recent in vitro studies of the amyloid formation of Aβ demonstrate that the species mentioned all occur but that they are only transiently populated [18–21]. Moreover, their isolation and characterization are hampered by solvent extraction procedures and detection methods [22, 23], making it difficult to study them in detail. However, looking at the studies available, a hypothesis can be formed that the key determinant for the neurotoxicity of Aβ not only involves the degree of oligomerization, but also the specific structural conformation of peptides in the assembly. This concept reconciles the apparently contradictory results that widely differing preparations of Aβ exert similar cytotoxic effects, and offers the therapeutic potential for targeting the key conformation with small molecules or monoclonal antibodies. This review will discuss the degree to which a specific conformation rather than a specific oligomer size may act as the key determinant of development of AD. Since the establishment of the amyloid cascade hypothesis, significant research effort has been focused on the identification of specific Aβ species in the brain that could be related to AD. In spite of this, it remains unclear exactly what happens to Aβ in vivo after it is cleaved from the amyloid precursor protein by γ-secretase. It is known that the carboxy-terminal heterogeneity generated by γ-secretase may be an important contributing factor since in vitro preparations of the two major peptide fragments generated, Aβ1-42 and Aβ1-40, display a marked difference in neurotoxicity by a range of biophysical assays and this correlates with a clear difference in aggregation behavior . For example, samples of synthetic Aβ1-40 primarily exist in vitro as a monomer/dimer mixture, whilst from the time of preparation (time zero) samples of Aβ1-42 also contain a range of other low-order oligomeric species . The assembly of mature Aβ amyloid fibrils is generally described as a nucleation-dependent polymerization reaction. Like any chemical process, the characterization of this assembly process requires the description of the order in which the relevant molecular species occur along the reaction pathway. However, as aggregation is a stochastic process, molecules will not synchronize during the reaction and, as a result, the reaction mixture will be highly complex and composed of several species at any given time. Homogeneity of the sample is not thought to occur until after the polymerization reaction is complete and even then it is possible that the formed mature fibrils or plaques are not eternally stable. To make matters worse, the composition of the reaction will be significantly modulated by peptide concentration and physicochemical parameters, such as temperature, ionic strength and pH. It is thus not surprising that independent studies of this highly dynamic reaction mixture have yielded a plethora of transient molecular species that have been claimed to occupy an essential position along this pathway. The transient nature of the intermediate oligomers is equally challenging for the characterization of the toxic potential of these species , and thus a number of differently sized oligomers have been suggested as the cause of AD (reviewed in [26–28]). In general terms, the kinetics of fibril formation by Aβ, as well as many other disease-related and synthetic amyloidogenic peptides, consists of a lag phase, during which a thermodynamically stable nucleus needs to accumulate, which is then followed by a rapid elongation phase that sees the formation of mature amyloid fibrils . However, on a structural level there is significant debate over which conformational changes are essential for the timing of the reaction. Most proposed pathways for the initial stages of Aβ amyloid fibril formation amount to a sequence of events that can be summarized as follows: unordered monomeric Aβ in solution converts into an 'activated' monomer that then recruits other Aβ molecules to form low-n oligomers . Several studies proposed that monomeric Aβ in solution exists in an equilibrium between an α-helical and a β-sheet conformation (step I in Figure 2) and from this mixture only the β-sheet conformer can accommodate the formation of low molecular weight, β-sheetenriched oligomers (step II in Figure 2) [31, 32]. In sharp contrast, other reports suggest that the conformation of Aβ in the activated monomeric state involves α-helical components . Interestingly, the ambiguity between α-helical and β-sheet propensities is a sufficiently frequently occurring feature of amyloid forming sequences that it can be employed to identify such sequences [34, 35]. Moreover, helix-helix associations have been proposed to constitute the major mode of early associations between proteins en route to amyloid formation. Apart from Aβ, other well-known examples displaying similar characteristics include islet amyloid polypeptide, α-synuclein and calcitonin . This helix association pathway would require an as yet undefined rearrangement of the initial helical species into a β-sheet conformation, but is supported by a range of nuclear magnetic resonance (NMR) studies of the solution structure of Aβ that report an α-helical structure for the monomeric peptide. 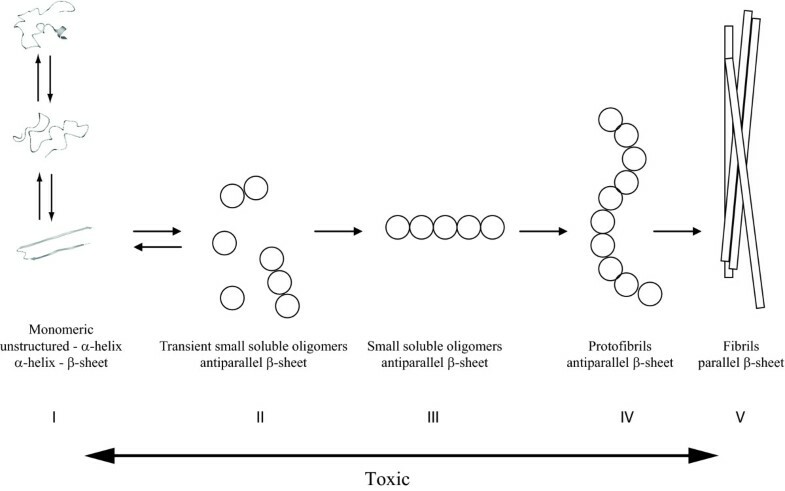 Aggregation scheme of amyloid beta peptide involving the transformation of monomeric amyloid beta peptide through a variety of toxic oligomeric stages to a mature fibril. The arrow at the bottom shows the toxic timeframe derived from publications. The scheme has been adapted from Bartolini and colleagues . Step I describes the equilibrium of the amyloid beta peptide (Aβ) monomer between random coil, α-helix and β-sheet. The β-sheet structured Aβ molecule has been adapted from Lührs and colleagues  (PDB structure 2BEG) and the α-helix-containing Aβ molecule has been modified from Sticht and colleagues  (PDB structure 1AML) using molecular dynamics with Yasara to obtain the given presentation . It has to be noted that most of these studies were done in the presence of organic solvents and detergents that were intended to reduce the peptide's aggregation rate sufficiently to allow the recording of NMR spectra. Interestingly, several studies of the conformations of Aβ in the presence of lipid membranes have reported increases in both α-helical  and β-sheet structures . It is generally known that some detergents and organic solvents can induce secondary structure in proteins, particularly α-helical structure (reviewed in ). Yet, two carefully conducted studies employing solution NMR and molecular dynamics without the use of organic co-solvents and detergents failed to detect significant α-helical stabilization for Aβ [39, 40]. Whether significant stabilization and population of such an intermediate is indeed required to trigger toxic oligomer formation can be debated. To illustrate this, it has been shown for both HypF-N and human lysozyme that aggregation can be initiated by a population of less than 1% of a specific partially folded conformation [41, 42]. Small and only transiently populated conformations hence could provide the key to toxic oligomer formation. Nevertheless, the conflicting nature of published reports on the conformational bias in monomeric Aβ suggests several aggregation-prone conformations may coexist and that environment heavily influences the route taken by most of these molecules. Moreover, post-translational modifications and the terminal hetero geneity that characterizes Aβ in vivo may play a dominant role. Whatever the conformations that drive the initial associations of Aβ peptides, the resulting low-n oligomers seem to be consistently enriched in β-sheet structures, although the topology of the strands remains unresolved: some groups report that oligomers contain exclusively antiparallel β-sheet structure (step III in Figure 2) , whereas others suggest a mixture of antiparallel and parallel β-sheets . Structural investigation of the Aβ aggregation pathway has suggested that antiparallel structures need to convert to a parallel topology in order to allow formation of the so-called protofibrillar state of Aβ (step IV in Figure 2), which is the individual building block of the amyloid fibrils and is thought to consist of a single array of peptides in a parallel β-sheet like conformation . The length-wise association of individual protofibrils produces the mature amyloid fibrils, whose structure has been studied in most detail due to their high stability under a wide range of physicochemical conditions (step V in Figure 2). For example, a model of Aβ amyloid fibrils derived using solution NMR with hydrogen-deuterium exchange and mutagenesis suggests that residues 18 to 42 stack as β-hairpin-like structures along the fiber axis . Although there is an ongoing debate on the exactinvolvement of particular residues in this arrangement (in particular the location of the loop), there seems to be general agreement that the amyloid fibrils that accumulate in plaques found in the brains of patients with AD are stabilized by a backbone of two intermolecular parallel β-sheets connected by a loop region . In Figure 2, we show a schematic outline of the current known aspects of the fibrillation mechanism of Aβ, based on a recently published scheme by Bartolini and colleagues . It remains unclear how oligomer size corresponds to conformational reorganization or how oligomer size and conformation combine to yield a toxicity response. 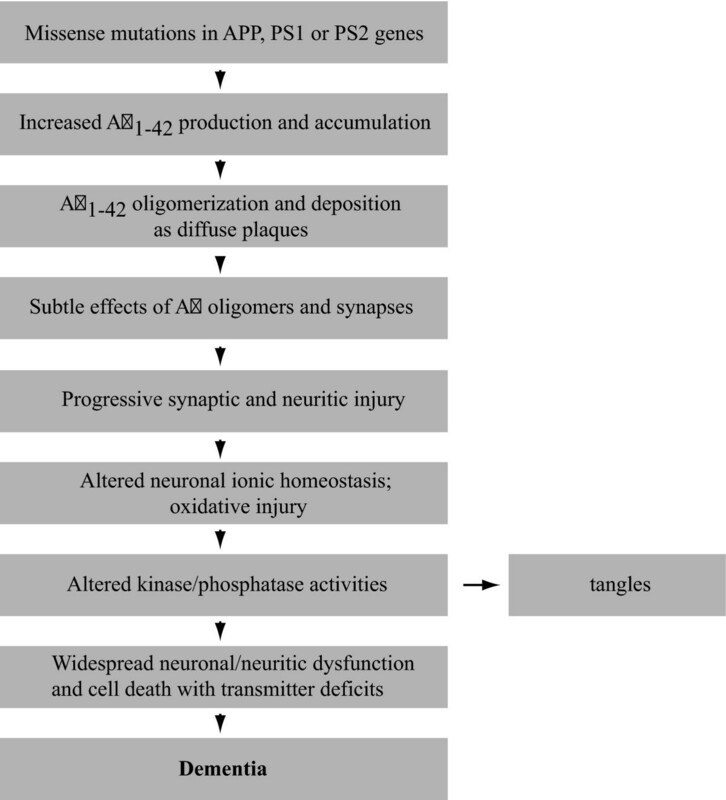 The search for an Aβ species that is capable of causing cognitive disorder as observed in AD patients led to several reports of animal-cell derived [13, 47, 48], humanderived  and synthetically prepared [9, 49–52] oligomers that have been found to induce disruptions of synaptic activity in vitro or impair cognitive function in animal models. For extensive reviews on these species see [26, 27, 53]. Monomeric forms of Aβ have frequently been proposed as toxic modulators in the development of AD. For example, Taylor and colleagues  reported that maximum cell damage observed in SH-EP1 cells and hippocampal neurons using a SYTOX Green assay coincides with the accumulation of a monomeric Aβ species able to multimerize into higher-n Aβ species, also called 'activated monomer'. Similarly, mature Aβ fibrils have been suggested as potent neurotoxic AD-inducers, although with similar inconsistent findings as for monomeric Aβ. The hypothesis that not all fibril morphologies are equally toxic, leading to variable results with regard to cytotoxicity, was successfully challenged by Yoshiike and colleagues . They reported that, using point mutations and chemical modification, both a β-sheet fibrillar structure as well as the surface physicochemical composition of the fibril define the toxic potency of Aβ. One year earlier, Puzzo and Arancio  had shown that synthetically derived fibrillar Aβ can impair the late phase of long-term potentiation. As it is very difficult to ensure the purity of a monomeric or fibrillar Aβ solution, without contamination of either preseeds or protofibrillar material, it can not be excluded that the toxicity observed for monomeric and fibrillar Aβ is actually the result of contamination. Moreover, increasing evidence suggests that the toxicity of Aβ originates instead from oligomeric Aβ, for which reason this review will further focus on the role of oligomeric Aβ in the development of AD. In 2008, the Walsh lab identified an enrichment of sodium dodecyl sulfate (SDS)-stable Aβ dimers in both human AD patients and rat cerebrospinal fluid (CSF)  that activate glial cells and can lead to nerve cell death in cultures containing astrocytes . Injection of human CSF containing Aβ dimers but not higher-n Aβ oligomers into animals showed a complete abolishment of long-term potentiation (Figure 3e); this adverse effect could be reversed by the systemic infusion of the synthetically derived anti-Aβ1-40 polyclonal antibody R1282. CSF samples that contained only Aβ monomer and no detectable dimer did not inhibit long-term potentiation. At this time it was also recognized that the isolation of large quantities of the SDS-stable dimer from human CSF was difficult, and a synthetic, disulfide stabilized Aβ dimer (Aβ1-40Ser26Cys) was prepared  and used to further explore any detrimental effects of Aβ dimers on synaptic activity . Later studies  used a combined approach of immunoblotting and western blotting techniques to study the Aβ population in J20 mice carrying Swedish and Indiana mutations in amyloid precursor protein. These studies showed that before SDS-stable dimers can be detected, Tris-buffered saline and triton-insoluble Aβ aggregates are present, suggesting that the assembly of Aβ species throughout life is dynamic and heterogeneous. The authors further concluded that it would be difficult to attribute synaptotoxicity to one single Aβ species. Amyloid beta peptide is (synapto)toxic over a wide range of sizes. (a) Lipid-derived amyloid beta peptide (Aβ) oligomers cause learning and memory impairments in mice. Passive avoidance test of mice injected with backward protofibrils. Light-dark step through test showed latency of entrance during the training accompanied with electrical shock (white bars) and during the testing 24 hours later (black bars). Injection of Aβ fibrils/brain total extract (BTE) mixture-soluble fractions 1.5 hours before the shock impaired memory in contrast to groups injected with control vehicle. From Martins and colleagues . (b). Soluble Aβ extracted from Alzheimer's disease (AD) brain alters hippocampal synapse physiology and learned behaviour. Rats receiving AD Tris-buffered saline (TBS; dashed line) had a significantly shorter mean escape latency than animals receiving immunodepleted AD TBS (continuous line) at 48 hours after training. From Shankar and colleagues . (c) Effects of purified brain Aβ*56 (soluble Aβ species with an apparent molecular weight of 56 kDa) on memory of young rats. Aβ*56 impairs spatial memory. Rats that received vehicle but not Aβ*56 injections showed a significant spatial bias for the escape location 24 hours after training . (d) Vulnerability of NT2 cells to soluble oligomeric Aβ in vitro. The ability of cells to oxidize MTT was used as a measurement of cell viability after treatment with Aβ. Cells were incubated in the presence of different concentrations of either Aβ or equivalent amounts of dimethyl sulfoxide (DMSO) control for 20 hours. The x-axis represents the concentration of soluble oligomeric Aβ. The y-axis represents the percentage of viability of cells compared with the DMSO control. From Kim and colleagues . (e) Human cerebrospinal fluid (huCSF) containing clearly detectable Aβ dimers disrupts synaptic plasticity in vivo. Samples of huCSF containing Aβ dimers (huCSF D) completely inhibited long-term potentiation, and this inhibition was prevented by previous immunodepletion of Aβ. Untreated huCSF (open circles), and immunodepleted samples (filled circles) were injected 10 minutes before high-frequency stimulation (arrow). From Klyubin and colleagues . ADDL, Aβ-derived diff usible ligand; EPSP, excitatory postsynaptic potential. In 2006, the Ashe lab reported that the presence of an extracellular, soluble Aβ1-42 species with a molecular weight of 56 kDa (Aβ*56) coincides with memory loss of Tg2576 mice and that administration of an isolated fraction of Aβ of this molecular weight induced similar memory loss in young rats  (Figure 3c). Interestingly, this much larger 56 kDa species results in a similar AD-like phenotype to that occurring with the dimer described by the Walsh lab, suggesting that AD-related toxicity is extended over a very wide range of Aβ oligomer sizes. A recently published work systematically comparing the effects of brain-or cell-derived Aβ assemblies with synthetic preparations further corroborated a concentration-dependent detrimental effect of Aβ*56 oligomers on cognition in rats . In 2008, work by our own group suggested that mature fibrils may not be the inert end-products of a pathway involving the formation of a heterogeneous population of transient toxic Aβ oligomeric species . We found that co-incubation of mature Aβ fibrils with biomimetic membrane particles results in the release of toxic Aβ oligomers, suggesting a fibril to oligomer pathway. Incubation of released Aβ oligomers from fibrils on hippocampal primary neuronal cell cultures resulted in profound cytotoxicity, and animals injected with these oligomers showed significant cognitive decline compared with control animals (Figure 3a). The main question arising from these observations is whether this fibril to oligomer pathway might occur in vivo. Nevertheless, it has been reported that secondary lipid metabolic disorders, such as hypercholesterolemia [60, 61] or deregulation of sphingolipid metabolism , frequently co-occur with a diagnosis of AD. An interesting link with regard to this is the established fact that the ε4 allele of the gene encoding apolipoprotein, a cholesterol-carrying protein, has been defined as the major risk factor for AD, while the ε2 allele is protective [63, 64]. An extensive review on the role of the apolipoprotein E allele type on progress of AD has appeared recently . The relevance of such an apolipoprotein E allele type in the lipid-induced dissociation mechanism leading to sporadic forms of AD as well as the precise contribution of lipid-induced Aβ fibril dissociation and the link with apolipoprotein E phenotype in vitro remain to be confirmed. In 1994 Oda and colleagues [66, 67] first mentioned that incorporation of clusterin (apoJ) into an Aβ1-42 solution inhibited mature fibril formation but stabilized a slowly sedimenting Aβ1-42 aggregate. Aggregates formed according to this protocol are resistant to low concentrations of SDS (prepared in the presence of clusterin (apoJ)) and enhance oxidative stress in PC12 cells. A similar aggregating species can also be formed in the absence of clusterin by employing cold-induced aggregation . These so-called ADDLs potently disrupt long-term potentiation in hippocampal slices from young adult rats at very low concentrations , reduce cell viability in a range of different cell lines  (Figure 3d) and were found to alter cell viability by affecting membrane thickness and inducing overall ionic leakiness . Structural characterization revealed that ADDLs are small (approximately 4.8 to 5.7 nm), soluble globular structures [9, 70] with an estimated mass of 17 to 42 kDa (derived using atomic force microscopy (AFM))  that migrate during SDS gel electrophoresis to 17 kDa and 27 kDa, with the latter being the predominant species . 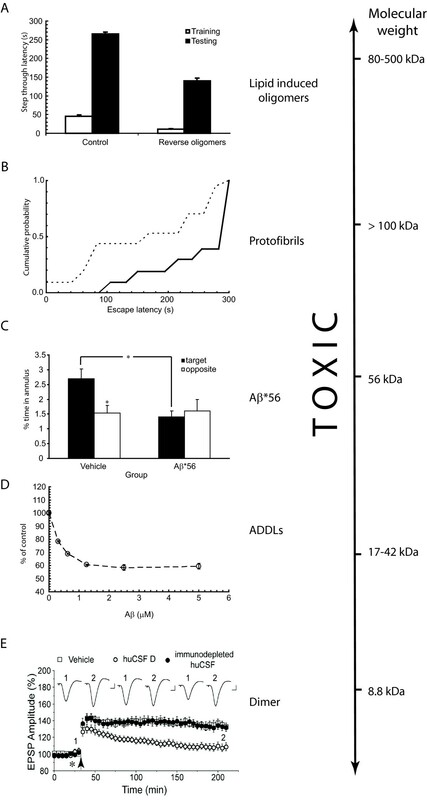 The very low concentration required for a toxic response led to the hypothesis that ADDL-induced toxicity may be specific and it was postulated that such toxicity mightinvolve specific cell-surface receptors [9, 68]. Aggregation kinetics of Aβ1-40 and Aβ1-42 were investigated by Harper and colleagues  and Walsh and colleagues  using AFM. These studies detected curvilinear, soluble assemblies, termed protofibrillar aggregates, which appeared to be intermediates on the pathway to amyloid fibril formation. Their transient and intermediate nature was confirmed by the finding that these aggregates grow slowly at first and then rapidly disappear in favor of the formation of mature amyloid fibrils . Their involvementin disease was derived from size exclusion chromatography experiments showing that Aβ1-42 and Aβ1-40 E22Q (later called the 'Dutch' mutation), accumulate more protofibrils compared with wild-type Aβ1-40 , and they were found to inhibit memory formation in animals  (Figure 3b). Morphological characterization of these protofibrillar structures by AFM, transmission electron microscopy, quasielastic light scattering and size exclusion chromatography revealed that these curvilinear, soluble assemblies have an apparent mass of > 100 kDa, a diameter of 6 to 8 nm, and a length of ≤200 nm . The wide variety of transient and intermediate Aβ species on the pathway to fibril formation (dimers, trimers, higher n-mers, protofibrils) that have been detected by several studies over the years have all been found to exert toxicity on cells in a manner that supposedly causes AD (Figure 3). Interestingly, Bernstein and colleagues  showed by using ion mobility spectroscopy coupled with nanoelectrospray mass spectrometry that Aβ1-42 can spontaneously co-exist as monomeric or as large oligomeric aggregated species. These large species rapidly developed into large aggregates. However, filtration employed to remove large species resulted in the formation of small oligomers that did not convertinto large aggregates rapidly. Various subfibrillar Aβ-derived toxins have been detected in vivo [72–74] and these all correlate well with brain dysfunction and degeneration observed in both transgenic mice and humans [7, 75]. The extraction and analysis procedures used to study these Aβ fractions involve methods that have been established to dissociate or, at least, destabilize fibrillar proteins and include homogenization, addition of SDS, β-mercaptoethanol or urea and boiling [7, 75]. Therefore, it is not clear whether any of these species really occur in the diseased brain. Another approach, involving the preparation of oligomeric Aβ from a synthetic source and subsequent evaluation of their impact on synaptic activity or cytotoxicity has proven a valuable approach to circumvent the use of harsh extraction procedures for analysis of in vivo occurring Aβ. A recent publication by Reed and colleagues  compares the effects of Aβ derived from synthetic sources, transfected cells and mouse or human brains. Cognitive effects were studied using the Alternating Lever Cyclic Ratio cognitive assay upon intraventricular injection with Aβ from various sources into rat brains and it was found that Aβ oligomers from all sources are potently able to induce cognitive defects. The mature fibrillar form and monomeric Aβ have both been confirmed on many occasions as the only non-toxic species. Moreover, co-incubation with the toxic-conformation-recognizing antibody A11 suppresses the toxic effect of Aβ oligomers, suggesting that, even though these Aβ species vary widely in size and shape, there must be a common denominator to their toxic origin. Even more interestingly, many proteins, either disease-related or non-disease-related, have been found to undergo a specific conformational transition thatis toxic to cell cultures and is A11-reactive [19, 76]. However, A11 reactivity as such does not always correlate well with the potency of Aβ assemblies to induce toxicity, as was reported recently by Noguchi and colleagues . These researchers isolated an A11-negative fraction of Aβ from brains inflicted by AD or dementia with Lewy Bodies morphologically appearing as a 10- to 15-nm spherical Aβ species and reproduced these structures using synthetic Aβ. Both assemblies induced damage to human neuronal cells and mature rat hippocampal neurons, and these Aβ species were assigned a role in disturbing presynaptic signaling mechanisms . It appears that even though it is potentially useful for preliminary screening for toxic potency, A11-negativity does not exclude the possibility of Aβ assemblies playing a major role in the disease mechanism of AD. It is hence advisable to combine studies using the A11 antibody with complementary results on the neurotoxicity of detected or isolated Aβ species. An important discussion that tightly links into the field of defining the most toxic species of Aβ is that on defining to what extent cytotoxic and neurotoxic results actually representin vivo pathophysiological mechanisms leading to AD. A wide range of results are used to assay for the effects of Aβ on (neuronal) cells, which can be divided into experiments probing for general cytotoxic, and more specific neurotoxic deviations. For example, assays that exclusively evaluate the cytotoxic effects of Aβ species largely ignore subtle changes that have been shown to occur in the metabolism and functional output of neuronal cells prior to overt cell death (reviewed in ). Aβ is known to be a dynamic molecule, converting from monomeric through a number of lesser-defined oligomeric stages to mature plaques; as a consequence, time points at which cytotoxicity is observed do not reflect the initial stages of the damage Aβ inflicts. A further complication with regard to neurotoxic results is that the actual initial stages of the disease are not known and have been reported to involve, for example, microglia cells of other than neuronal origin (reviewed in ). An elaborative review on the toxic effects of Cu/Zn superoxide dismutase (SOD1), implicated in amyotrophic lateral sclerosis, illustrates how the protein can affect multiple cell types in a highly complex manner which, judging from the complexity of the brain anatomy as well as the difficulty in developing a treatment and pinpointing the actual triggers for onset of AD, may well be applicable to AD as well . These findings suggest that one single result does not necessarily embrace all the facets involved in the development of AD and underlines the necessity to employ a multidisciplinary approach, including assays to report on the early effects (for example, long-term depression (LDP) or synaptic activity read-outs) and late effects (cytotoxic effects) of Aβ on a cellular level as well as, for example, cognition assays to evaluate the progress of the condition overall. It further implies the importance of investigating the continuity of the disease in terms of time lines of appearance of specific symptoms and cellular effects rather than a single time point or Aβ species. A publication that illustrates the dynamic effects of Aβ toxicity rather well shows that Aβ-mediated neuronal cell death is a dynamic process, depending on the progress of the aggregation pathway of Aβ, rather than a stable situation . It is worth mentioning some issues with regard to the actual measurement of the potency of Aβ species to induce potentially pathophysiological effects in AD models. A frequently used assay for this purpose is the MTT assay, which is based on the conversion of yellow 3-(4,5-dimethylthiazol-2-yl)-2,5-diphenyltetrazolium bromide (a tetrazole) into purple insoluble formazan. The formazan compound is subsequently solubilized by a solubilization solution and the absorbance of soluble formazan can be measured spectrophotometrically . The reduction reaction to formazan can, however, be affected by Aβ in the absence of cell death [83–85]. A number of potential reasons for this effect have been discussed by Wogulis and colleagues  and range from variations in formazan crystal morphology, exocytosis of MTT formazan, MTT-induced interaction of Aβ with intracellular targets and effects of Aβ on the neuronal membrane. A further discrepancy that is frequently highlighted in the literature is the observation that often non-physiologically related and excessive concentrations of in vitro prepared Aβ are required to observe detrimental effects. For example, in cell cultures Aβ usually needs to be added in the micromolar range for effects to be observed, while physiological concentrations of Aβ in vivo are estimated to be in the nanomolar range. One recent publication provides a potential answer to this question by showing that Aβ can be taken up by neuronal-like cells but not neuron-unrelated kidney cells. Upon uptake, Aβ can accumulate in late endosomes or lysosomes, where Aβ concentrations of up to 2.5 μM can be reached. At such elevated concentrations Aβ was found to form high molecular weight Aβ assemblies and these assemblies can, in turn, seed amyloid fibril formation . Toxic species or building block? It is entirely possible that all the preparations mentioned in the previous paragraphs are unified by a highly potent neurotoxic Aβ assembly of well defined size that is present at concentrations that preclude direct detection but mediate toxicity effectively, and that this elusive species is the cause of AD. However, it is more likely that a wide range of Aβ oligomers are toxic. Given that the reaction mixture is highly heterogeneous, the purified species is an almost arbitrary result of the conditions chosen to enrich the fraction and the method employed to establish a size estimate. The apparent molecular weight of a particular fraction is usually estimated from its elution profile from matrix-assisted molecular sieving techniques, such as gel electrophoresis and size exclusion chromatography, often carried out in the presence of low concentrations of SDS (0.1%). In order to arrive at a molecular weight estimate, the mobility of the oligomeric fraction needs to be compared to those of other proteins and peptides that act as molecular weight standards. There are several problems with this approach. First, in the absence of even these low doses of detergent, the elution profiles show almost exclusively higher molecular weight assemblies, raising the question of whether the reported molecular size corresponds to the neurotoxin itself or merely to a stable fragment [22, 23, 87]. Second, comparison with migration profiles of reference proteins is not reliable for aggregating proteins that have a notorious feature thatis systematically underestimated in the AD field: amyloid fibrils and their precursors are employed in nature for their mechanical strength and high adhesiveness on a range of surfaces. Bacteria, for example, employ curli amyloids for adhesion to host organism tissues or to colonize a synthetic surface . When such preparations are subjected to molecular sieving, they will hence be sorted by their affinity for the matrix and resistance to the employed flow rate, thereby obliterating the main assumption required to use molecular sieving profiles to estimate size. When sample fractionation is achieved in detergent free buffers, and the molecular weight is measured using an absolute technique, such as static light scattering, that does not require comparison of the migration rate through some chemical matrix, significantly higher molecular weight species have been observed, both by us  and by others . In conclusion, it remains unclear which of the species discussed above occurs as quasi-independent units in the brain of AD patients or if they are usually part of larger molecular assemblies. After all, the extraction procedures used may importantly affect the Aβ species obtained, which might not necessarily reflect those involved in the development of AD. One apparent conclusion that can be drawn is that the toxic form is neither monomeric nor fibrillar, and that the toxic species is a soluble form of Aβ. As oligomer size does not correlate tightly with the progression of AD, it seems likely that the toxic behavior can be induced by factors other than oligomer size alone. A complete overview of the pathways through which Aβ oligomers are thought to mediate toxicity falls well outside the scope of this article and these are reviewed extensively elsewhere [90, 91]. However, we need to briefly consider them here in order to understand the structural requirements for toxicity-mediating interactions. It now seems that soluble Aβ oligomers do not affect the lifecycle of neurons in general but that the effect may be more specifically related to the interference of synaptic function, judging from the low effective dosage required to induce a toxic response , and more specifically, that Aβ oligomers interfere with the machinery responsible for synaptic vesicle release at the presynaptic terminal (for reviews see [53, 92]). Two major classes of mechanisms have been proposed to explain how Aβ oligomers interact toxically with the cell. One class is receptor-mediated interactions, such as the previously proposed interactions between receptor × and ADDLs , the interaction with N-methyl D- aspartate receptors [93, 94] or the interaction with human prion proteins by the Strittmatter group . Although the conformational requirements for receptor-mediated toxicity have not been extensively studied, we know from other protein-peptide interactions that structural requirements are usually very specific . The second major group of toxic mechanisms involve some form of membrane disruption, which is also a much explored potential disease mechanism for several other amyloidoses (for a review see ), lending support to the idea that amyloid formation by any peptide sequence goes through a toxic intermediate structure. In fact, a common mechanism for amyloid toxicity, such as was proposed by Dobson and Stefani and colleagues  from toxicity studies of a range of amyloid fibrils, could be equally compatible with a receptor-mediated interaction, although the focus in this field has been strongly on membrane disruption. Another strong line of support for the notion of a toxic conformation comes from the conformationspecific antibody A11, which also recognizes several other amyloidogenic proteins and peptides that are known to form pore-compatible oligomers [19, 99]. A recent review by Glabe  explores the concept of conformationdependent toxicity in more detail. The strong focus on the sizes of Aβ assemblies that display potency in the disruption of neuronal function may falsely give the impression that other structural aspects, like peptide conformation, are being neglected. However, when considering the possible molecular mechanisms by which the Aβ peptide exerts its toxicity, the conformation of the individual peptide in the molecular assembly is clearly a critical factor that needs to be carefully considered, and both receptor-mediated interaction and membrane disruption models impose specific structural requirements on the oligomers. Progress in this field is slow, however, since techniques for studying peptide conformations suffer from the experimental difficulties of working with heterogeneous aggregating samples even more than molecular sizing techniques as they generally require higher peptide concentrations, further promoting aggregation. The seemingly conflicting results obtained by different groups on the size requirements of the toxic Aβ oligomer could be elegantly unified when a model is considered in which peptide oligomerization provides the necessary intermolecular interactions required to stabilize a toxic conformation that cannot be adopted by a monomer in isolation. In such a model any oligomer could be toxic as long as its constituent peptides are maintained by the intermolecular interactions in the appropriate conformation to mediate toxicity, rendering dimers as potently toxic as 12-mers or higher order oligomers. The model would further predict that oligomerization is required per se (independent of exact size) and that a specific conformation needs to accumulate in the Aβ oligomer fraction in correspondence with toxicity. Substantial evidence supports the hypothesis that fibrillar Aβ is conformationally distinct from monomeric Aβ but the investigation into the specific structural transition states of Aβ along the pathway to mature fibrils has been hampered by the inability to arrest the transient Aβ oligomers in stable, intermediate conformations. A variety of spectroscopic techniques have shown that monomeric Aβ is disordered in aqueous solution, adopting some nonrandom, local conformations [101, 102]; thus, it can be categorized as a 'natively disordered' protein, such as α-synuclein, which is implicated in Parkinson's disease (for a review on natively disordered proteins see ). Solid-state NMR studies have revealed that Aβ fibrils are organized in a parallel β-sheet structure (for a review see ). Site-directed spin labeling showed that fibrillar core regions are composed of 20 amino acids or more (for a review see ) and the cores of most amyloid fibrils, including those composed of Aβ, have been found to assume a typical steric zipper conformation . The question that arises is: does unstructured Aβ directly transform into a well-organized fibril or is/are an intermediate(s) involved? Moreover, how does such a transition in structure relate to the toxicity observed for oligomeric Aβ? A structural investigation using circular dichroism on the fibrillation pathway of Aβ1-40 by Walsh and colleagues  suggests that Aβ first forms a transitory α-helical conformation and then transforms into a β-sheet characteristic for fibrillar Aβ. Accumulation of early α-helical enriched intermediates has been reported before using in vitro experiments and molecular modeling [43, 107–110]. Whether α-helix formation is relevant within the AD context or is on-  or off - pathway  has been an issue of debate. However, the fact that aggregation and toxic effects in cell culture and hippocampal slices are inhibited and that locomotor activity is improved and the lifespan prolonged in Drosophila melanogaster in the presence of ligands that bind to and stabilize a region in Aβ in an α-helical conformation  supports the on-pathway paradigm. Such an effect can be explained either by a neutralizing effect on toxic α-helical Aβ or, alternatively, by these inhibitors blocking earlier stages in the aggregation process that can lead to the formation of the actual toxic species. The occurrence of a kinetic intermediate composed of α-helical components is not limited to Aβ but is also observed for a range of other peptides, such as insulin [112, 113] and a model 38-residue helix-turn-helix peptide, αtα . Computational analysis of the fibrillation pathways of Aβ1-40 and familial AD-related mutations suggests that early events involve the formation of an ordered, cross-β- structured nucleus composed of six to ten monomer chains . This supports an earlier proposition by Grant and colleagues  that the aggregate seed for Aβ involves a specific type of collapsed structure involving exposed β-strands. The evolution of β-structure upon higher order oligomerization and fibrillation has been published many times using a range of spectroscopic techniques, including circular dichroism [31, 107, 108], fiber X-ray crystallography  and Fourier transform infrared spectroscopy [32, 43], and also by computational methods . If both mature fibrils and growing oligo mers exhibit β-sheet structure, then what determines their differential toxic effects? Work by the group of Goormaghtigh has shown, using attenuated total reflection Fourier transform infrared spectroscopy, that an anti-parallel β-sheet conformation of Aβ distinguishes the oligomeric structure from the parallel β-sheet structure of mature fibrils . The experimental set-up used ensured careful preparation conditions for Aβ to obtain solutions enriched in either oligomeric or fibrillar Aβ. To support this suggestion, the work by Yu and colleagues  used NMR to show that oligomeric intermediate assemblies stabilized by the addition of detergents and fatty acids have a mixed parallel and antiparallel β-sheet structure that can alter synaptic activity. On a longer timescale this anti-parallel β-sheet rearranges into a less flexible parallel β-sheet characteristic for fibrillar Aβ . If the membrane-peptide interactions are indeed responsible for the onset of the cascade of toxic responses leading to cell death, then mutations in Aβ leading to early onset cases of AD should show considerably more pronounced interaction with membranes. The introduction of β-sheet breaking amino acids in the carboxyl terminus of Aβ1-42 [117–119], or co-incubation with β-sheet breaking compounds [120–123] or peptides  have been shown to be highly effective inhibitors of Aβ aggregation and to reduce toxic responses to Aβ in a neuronal cell culture [117, 119]. The relevance of β-sheet structure for toxicity has also been supported by the finding that many proteins respond to the conformation-specific antibody A11 , including natively folded proteins not related to disease-for example, a GroEL oligo mer complex, a bacterial chaperonin , heat shock proteins 27, 40, 70, and 90, yeast heat shock protein 104 and bovine heat shock cognate 70 , but also trans thyretin and α2-macroglobulin, both proteins associated with aggregation themselves and found to have a β-sandwich topology [125–128]. Interestingly and analogous to β-sheet breaker peptides, co-incubation of Aβ and a range of other oligomeric aggregates from α- synuclein, islet amyloid polypeptide, polyglutamine, lysozyme, human insulin, and prion peptide 106-126 with other A11-positive proteins has an anti-aggregation effect on Aβ  similar to co-incubation with A11 antibody  and limits toxicity in neuroblastoma SH-SY5Y cells as assessed by the 3-[4,5dimethylthiazol-2-yl]-2,5- diphenyltetrazolium bromide reduction assay and lactate dehydrogenase release . Moreover, recent work by Yoshiike and colleagues  has defined the epitope of the A11 antibody as the β-sheet edge of proteins. The A11 antibody is reactive to the Aβ oligomer conformation over a wide timeframe and recognizes pentameric Aβ up to protofibrils . This finding strongly suggests a structural similarity between all these species, which could be related to toxicity. SDS-stable tetramers and dimers are not recognized by the A11 antibody  but still have been found to exert profound toxicity in cell culture [11, 56]. However, extraction procedures to obtain dimeric and other low-n aggregated Aβ from tissue and neuronal cells that involve SDS or sonication could partly dissociate small oligomers into their basic building blocks. These findings show that toxic oligomeric Aβ, over a wide range of sizes, has a structure distinct from monomeric or fibrillar Aβ, which might provide the key to their toxic potential. The studies reviewed above highlight the challenging nature of identifying the critical component of the complex and constantly evolving reaction mixture that is the ageing Aβ peptide solution. However, the potential result will be highly rewarding as it will allow us to understand how known risk factors for AD map onto the formation of toxic intermediates of amyloid formation: do well established risk factors such as carboxy-terminal heterogeneity, the apolipoprotein E allele and age act by stabilizing the toxic substructures, and if so, which therapeutic interventions are best suited for counter acting these effects? Moreover, as long as we cannot accurately model the accumulation of the neurotoxic species, we cannot be certain that therapeutic intervention will produce the desired outcome. For example, an overall decrease in the concentration of Aβ may stabilize low-n oligomers, thereby potentially increasing rather than decreasing toxicity. In conclusion, a wide range of AD-related (synapto) toxic Aβ oligomeric sizes have been identified. How oligo mer size precisely relates to the disease process has not been clarified and recent work shows that the wide range of Aβ oligomers may have a specific conformation in common. These findings suggest that Aβ oligomer size may not be the only AD-inducing factor and we propose a new paradigm in which both oligomer size and structural arrangement act as toxic parameters in AD development. Studies targeting the toxic contributor to AD in the past have usually highlighted only one of these aspects, but we suggest that further studies should employ a multi disciplinary approach in which oligomer size, structural characteristics and synaptic activity results are recorded simultaneously over a long kinetic timeframe. Sufficient resolution in such a kinetic study should allow access to structural information on transient intermediates, which may be further supported by employing means of stabilizing these species using cross-linking, conformation-sensitive antibodies or lipid-induced fibril dissociation and by studying familial AD-related mutations in Aβ. We acknowledge the following people for valuable discussions and/or critical reading of the manuscript: Bart De Strooper, Iryna Benilova, Patrick Van Gelder, Kris Pauwels, Giulietta Spudich, Jose Couceiro, Jean-Marie Ruysschaert, Emilie Cerf, and Vincent Raussens. We acknowledge Joost Van Durme for his technical support providing the molecular dynamics and Yasara images. Research into Alzheimer's disease at the Switch laboratory is funded by an FWO Odysseus grant, and the Alzheimer Research Trust (ART) UK.